While evidence suggests that headline inflation may be receding globally, sporadic jumps in specific commodity prices are lifting the Reuters/Jefferies CRB Total Return Index (CRB) higher. Much of the price pressure is due in part to dislocations caused by erratic weather conditions across in various parts of the world. Some of the pressure, however, appears to be related to expectations for new cuts in global interest rates. The Chinese government’s chief priority of bringing inflation under control has had success. October’s annual consumer price index (CPI) increase fell to 5.5 percent in contrast to July’s peak of 6.5 percent. This success, however, has fostered the idea that the Chinese government may soon shift to a policy of monetary stimulus by lowering interest rates in the near future. Moreover, growing speculation that the ECB may move to buy more distressed sovereign debt issues from European banks comes on the heels of an unexpected cut in interest rates by the new ECB president Mario Draghi. The recent change of leadership and monetary policy in theOld Worldcomes at a time when their insipid financial crisis might cause a slowdown in economic activity generally. That being said, a recent report showingU.S.farmers are reaping their smallest corn harvest in three years could restrict an expansion in global food supplies. Moreover, feed supplies for livestock as well as a slowdown in ethanol production are each expected to raise prices of processed foods and meats, as well as pushing fuel costs higher. While poultry and livestock producers could move away from corn feed to wheat (thereby boosting wheat prices), worse than expected damage to the rice crop and inventories due to flooding inThailandhas kept those prices moving higher as well. Although overbought conditions are now present in crude oil futures, increased worries overIran’s nuclear program have helped to lift the price of spot crude to nearly $100 per barrel. In any event, the Reuters/Jefferies CRB Total Return Index (CRB) is approaching key trend line resistance at the 326 level with weekly technical oscillators rising bullishly. 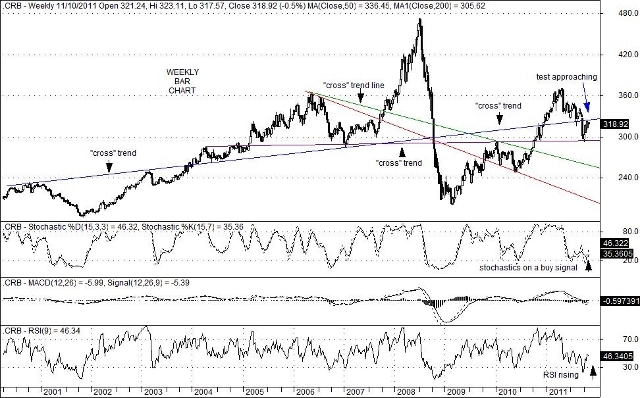 A break above 326 would be troubling for consumers, but could trigger a move by hedgers and speculators into long positions that could push the CRB index to much to higher levels over the intermediate-term. This entry was posted on Sunday, November 20th, 2011 at 2:26 am	and is filed under CRB Total Return Index (CRB). You can follow any responses to this entry through the RSS 2.0 feed. You can leave a response, or trackback from your own site.